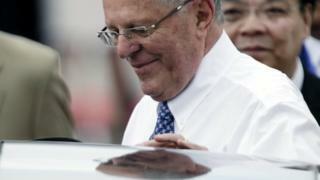 Peru's President Pedro Pablo Kuczynski has denied receiving any campaign donations or bribes from the Brazilian construction giant, Odebrecht. In a statement broadcast on national television, Mr Kuczynski also rejected claims that he had been hired as a consultant a decade ago. The allegations were made by the firm's former president, Marcelo Odebrecht. The company has been implicated in corruption cases in several Latin American nations. Marcelo Odebrecht, who is serving a 19-year jail sentence in Brazil, has agreed to cooperate with a major international corruption investigation in exchange for a more lenient sentence. He said Mr Kuczynski had been hired as a consultant in Peru a decade ago, after standing down as finance minister. He also told prosecutors that the construction company had paid $29m (£22m) in bribes to Peruvian officials over many years. Mr Kuczynski, 79, said the allegations were false. "I did not receive any support from that company in either of my two electoral campaigns," said Mr Kuczynski. "It is essential that we all fight corruption, and I am committed to that fight," he added. Peru is one of many countries allegedly caught up in the web of corruption spun by Odebrecht. The company has admitted paying bribes to secure lucrative contracts across Latin America and Africa. Former Peruvian presidents Ollanta Humala and Alejandro Toledo are under investigation. Mr Humala and wife Nadine Heredia have been put in pre-trial detention for 18 months. Mr Toledo fled to the US, and, like Mr Humala, denies wrongdoing. On Tuesday, a judge in Ecuador ordered that Vice-President Jorge Glas stand trial over corruption allegations. Prosecutors accuse Mr Glas, who was arrested on 2 October, of taking $13.5m (£10.2m) in bribes from the Brazilian construction giant. He denies the allegations. In Brazil, President Michel Temer and one third of his cabinet are facing allegations. Mr Temer has also denied any wrongdoing.